Thankfully this is NOT my own border story, for once. Friday morning I was waiting patiently in line at the border to show my passport, answer the requisite questions, and drive on towards my KoD. There was somewhat of a line up. How it works is that there is a bunch of HUGE stop signs about 40 feet from the actual booth. When there is a car at the guard’s booth you wait by the stop signs till you are signaled by the guard to come ahead. The car in front of the car in front of me (ie second car ahead of me) drove ahead to the booth. The car in front of me got all excited and shot off after it. Drove right up behind that car. Big huge no-no. Border guards came running from all directions. Made him roll down his window, made him back up to before the stop signs and wait his turn like he should have originally. One of them pointed out the six stop signs with exaggerated motions. When it eventually got to his turn, the border guard kept him for at least 15 minutes. He kept handing more papers over to the guard. Another guard came over and walked around the car, looked under it, opened the trunk, unzipped a few suitcases. More questions. (I think initially I experienced total schadenfreude that they had found someone else to annoy for once). Finally I saw the guard motioning to the driver to pull over by the immigration and customs building. I guess they weren’t finished with him. Honestly, I felt sorry for the dude by this point. He made a mistake and drove 40 feet a little too early…..did he deserve to be questioned so thoroughly? Did that make him a suspicious person? I do hope they finally let him go on to his destination. BH I made it through within 2 minutes of driving up to the booth. I was dying to ask the guard about the guy but that’s not something that would have been a smart move. If he had to hand over a bunch of papers, there was probably another issue — not just the premature appearance at the guard’s window. Once, when I was going to uni in the US, I was driving a friend down with me. He had to go in to deal with visa issues. There was a long line, so he thought he’d go into the building and take care of things while I waited in line. Well, the guards did not like that. They ordered him to get into the car and when he tried to explain the visa issues, the guard put his hand on his gun and told my friend to get in the car before he was cuffed. The questioning one we got to the window was not fun. Never mind the time the same friend told the guard he had Cuban cigars with him . 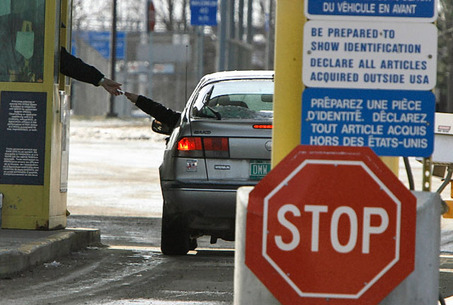 . .
Much worse thing to do: try to cross into Canada with a firearm. Even if you are an NYS trooper with your service revolver. As some CBP guards I was working with once told me, that is likely to land you in prison. They sound like hard-boiled guys. I am happy that I do not need to meet them. Europe sounds friendlier in that regard. I had something similar at the israeli border control in the airport in Tel Aviv. They ask the mundane questions to figure out if you’re lying about the really important stuff. Tough luck for them, but this way, they didn’t make a fuss over you.